Some time back, I started my day with a visit to a doctor, whose office is in a fairly large suburban office building. My car was parked right in front of the building, in a pull-in spot, facing the curb. When I was finished at the doctor’s, I came out, got in the car, and sat for a couple of minutes while I sorted out the rest of the day. Now, to understand what happened next, you have to understand that my car is not new. In fact, it is ten years old, a 2002 Honda CRV with 172,000 miles on it. It runs and drives perfectly, and meets my needs perfectly, but it certainly has a few dings and scrapes on it. So, I’m sitting in the car planning, and a mid-sized car pulls into the spot to my right, and I see right away that it is way too close, that the woman driving it won’t be able to open her door and get out. She saw it too, and started to maneuver, backing up, but, instead of backing straight out, she turned her wheel to the right, and it was obvious the fender of her car was going to hit the side of my car, and it did, with a bump and the clear sound of body panels rubbing. It didn’t sound like much, and I didn’t think it was going to be very noticeable, but it only seemed prudent to take a look while the other party was still present, so I got out and walked around the front of the car while the woman finished parking. I was careful to smile. I scanned the side of my car, looking for the fresh scrape. 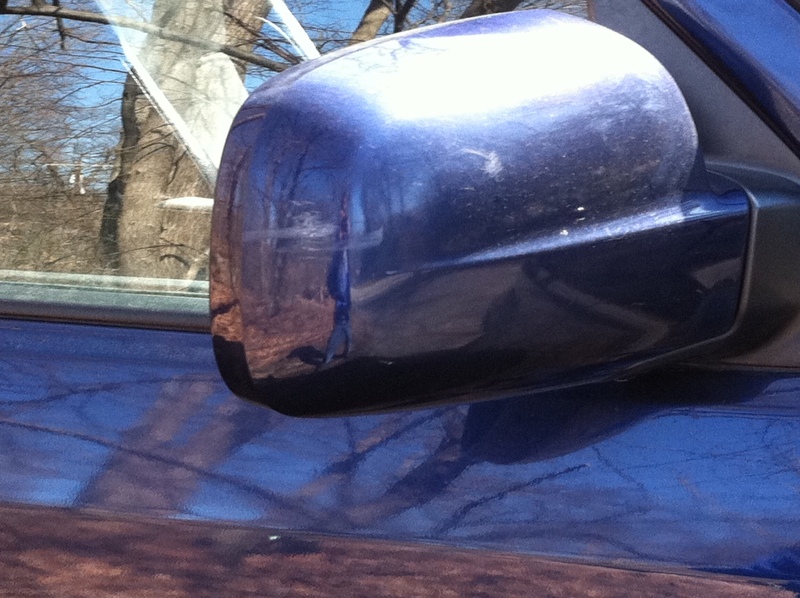 I never saw that scuff on the end of the mirror before -- could that be it? I checked my calendar, and that day was farther in the past than I remembered; it was last December 16. A few days later, while I was still mulling it over, my friend, Suya, posted a message to the online support group for people whose lives are touched by esophageal cancer. At that time, Suya’s husband, Pat, had been fighting stage-IV cancer for more than six years. (That is an extraordinarily long time to survive.) During the autumn, his cancer had gotten out of its cage and gone on a rampage. This had happened because of a shortage of chemotherapy drugs that had caused an interruption in his treatments. He had stopped all treatments, and entered a hospice program. There is a place with wonderful gingerbread in the area, so I went to get some for the staff at the Cancer Center yesterday. Pat and I went to deliver it. They were so delighted to see him. Lots of hugs and love to soak up. What struck me most was how surprised they all were that he was still alive and still doing as well as he was. I see him deteriorating daily and they see something different because they see cancer every day. None of them expected we would still be here together for Christmas. Even now, he continues to defy what is considered normal. I have so much gratitude for all of the healing and light that have been bestowed on us through the years of this journey. We all continue to offer healing energy and whatever quality of life we can give. Even after all these years, I find it difficult to wrap my mind around all of the healing I witness on a regular basis. What grace. This entry was posted in Cancer, Found Stories and tagged cancer, community, esophageal cancer, friends, grace, love, peace. Bookmark the permalink.